The Internet has grown at a phenomenal rate since it first reached the mainstream in the mid-90s. In less than two decades, the web has gone from being a newfangled tech thing to being an unconscious part of our daily lives. It’s been a rapid change that we’ve all had to adapt to, with some industries doing it better than others. That’s why last week’s LSE SU Advertising, Marketing and PR Society annual conference was themed around “How To Survive In A Digital World” — a question some of us still struggle with. 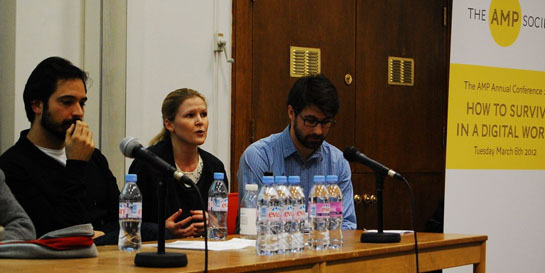 The day-long event, which featured a series of talks from digital experts, drew hundreds of students and industry members to the London School of Economics campus. Lectures on the impact of digital on the modern consumer journey, gamification in the social space, and what marketers can do with digital data set the stage for the evening’s much-anticipated panel debate, headlined by all the day’s speakers as well as Christian Gladwell, CEO of Human Digital, and Universal Music’s own digital strategy manager Julia Svennerstal. Given the theme of the panel — The Future of Digital — and how the music business is arguably the one industry most impacted by the digital revolution, the AMP Society was keen to hear from Julia about her predictions on how music would evolve. Right now, we’re in the age of Spotify, iTunes, and artists connecting directly with fans through social media like Tumblr and Twitter. The challenge, of course, is that all thiscan change in mere moments. Just think of how far we’ve come in 15 years.